How Do I Clean a Bathtub With Bleach? 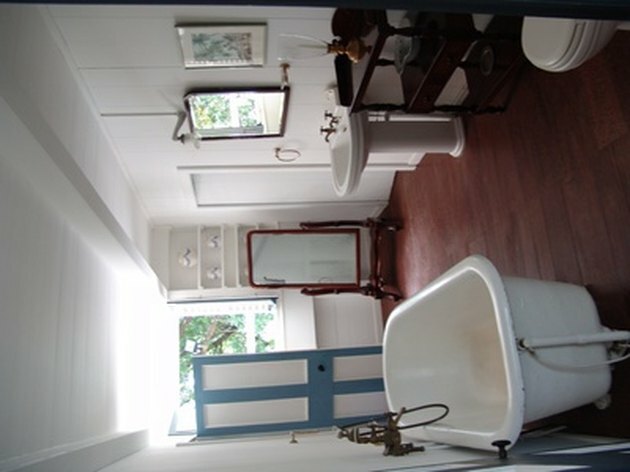 Bathtubs offer a suitable environment for mold and mildew, which can leave stains. Bleach kills both mold and mildew and will lighten these stains. Many commercial bathroom cleaners contain bleach for this reason. However, you can use straight bleach with water to destroy mold, mildew, bacteria and many stains on your bathtub. You can remove many stains from tubs with bleach. Open a bathroom window to let fresh air in. If your bathroom doesn't have a window, at least keep the door open while you are in there. Bleach fumes get strong quickly. Remove shampoo bottles, soap dishes and other materials from around the tub, as well as any anti-slip mat from the tub floor. Rinse out the tub with water and place a stopper in the drain. Put on rubber gloves and safety glasses. Fill the tub with approximately one gallon of water and add one cup of bleach. Fill a spray bottle with equal amounts of water and bleach. Shake this up and spray it over the inner walls of the bathtub. 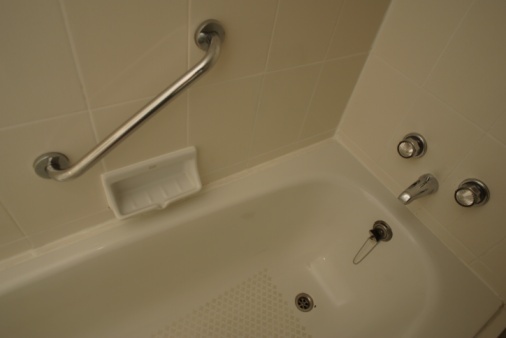 You can also use this solution on mildewed areas around the bathtub. Leave the room and give the bleach a chance to disinfect, kill mold and mildew spores and lighten stains. You should let the bleach solution stay on the bathtub surfaces for at least 10 to 15 minutes. Wet a sponge in the bleach and water mixture in the bathtub. Scrub the entire bathtub and then let the water drain out. Rinse out the bathtub with clean water to remove the bleach. Rinse the sponge and wipe the areas that you sprayed. Keep the bathroom window or door open to allow the room to air out so the bleach fumes can dissipate more quickly.